March 4th – I was going stir crazy. A bad day – the internet was getting me down, the thaw had set in and the world outside had the slimy, grey, filthy wet feel you only get with melting, heavy snow. I slipped out on an errand at sunset and something magical happened. I caught a surface-air temperature inversion. I saw it start on The Parade in Brownhills, as it was gathering over the common. I raced to Chasewater. It was stunning. An inversion occurs when the ground is colder than the air above and mist forms is very low, isolated pockets. I’ve not seen on this strong since I was a kid. Mist drifted around and almost deserted Chasewater, and I was in the middle of it, like a kid in a sweet shop. December 17th – Sunday was a much better day, but whilst the ice didn’t melt as much as I’d hoped, it was well on the way. I love ice and snow. But when it’s fresh; I can’t bear it hanging around. I like a good heavy snowfall, a few days of fun, then a fast thaw. Not so with this one. I looped around Brownhills on errands, delivering Christmas cards as night fell: The High Street was grey and damp in the drizzle, but the canal at Silver Street fascinating with the ice, broken up by a passing boat. Not feeling terribly Christmassy yet. Hope that changes soon. January 26 – I’d prayed to Thor, the god of meltwalter, but not much happened. We had heavy rain, then it refroze; but skipping out mid day for a sandwich and a brew, there was a sharp ramp-up in temperature, and the thaw set in with some urgency. It actually felt tropical. I had to admire the British stoicism of the picnickers with flask and camera. They didn’t even have a dog. Even the sailing club got their boats out. 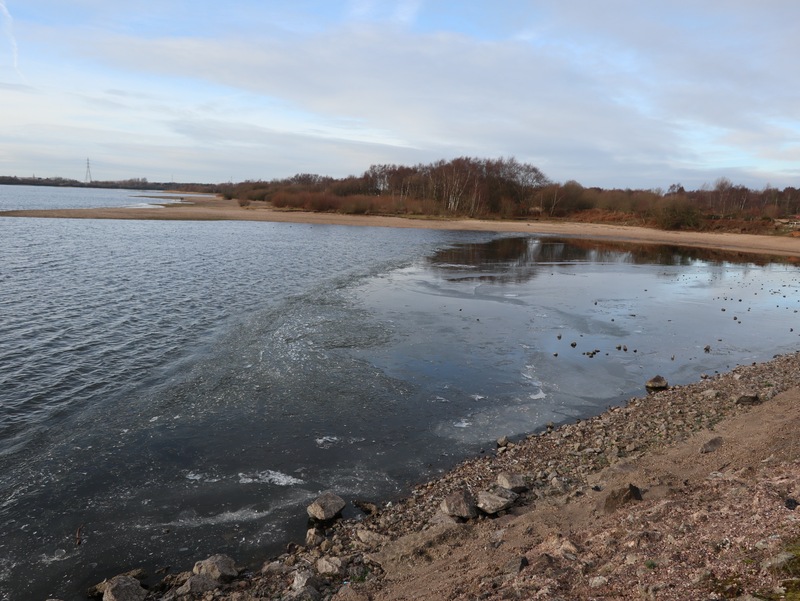 The riding was terribly poor; the ice on the paths around Chasewater was unridable as it was too mobile; it was like riding on pea gravel. The bird life is booming at Chasewater; we recently had the largest gull roost in many years, with upwards of 10,000 birds, and the waterfowl on the boating lake are as persistent as ever. I love the domestic white geese and the way they hector me for food. The water level continues it’s inexorable rise; on January 11th, the water was at 75com from the top of the scale, it’s now 64cm, a rise of 11cm or just over 4 inches. With the huge increase in lake surface area, that’s a immense amount of water. The 9-foot pool has now joined the main lake through the new bridge, and it won’t be long until the water overtops the weir into the spillway – that is, if it’s allowed to. It’ll be interesting to see the effects of the thaw. February 15th – Late afternoon, heading into Brownhills along the canal from Aldridge. 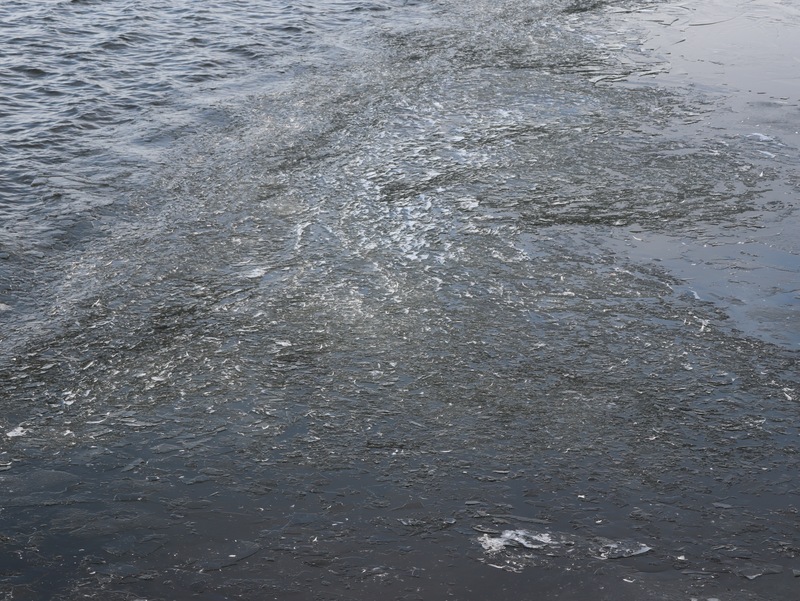 The unseasonal warm weather seems to have returned, but the ice was still loosening its grip on the canal. As the last of it melted away, I noticed the fabulous crazing pattern it generated on the surface as it broke up and wasted to nothing. I was captivated by the fantastically complex patterns. The simplicity of nature can sometimes catch you quite unawares. February 6th – it was a tough journey to work. After the chill of the previous week it felt almost humid, yet it was quite chilly with a constant, searching drizzle. The snow of Saturday was still melting, and there were huge pools of standing water on the roads. Dropping onto the canal at Bridgeman Street in Walsall looking for a break from the relentless traffic, the towpath turned out to present its own challenge. Not treacherous with the studded tyres, but hard work to plough through. Horrid.